Discovering new early microcomputers is always a rush, and recently Craig Solomonson had the pleasure of that experience. For years, he owned a system with the rather generic label of 8-Bit Micro Computer System. Unfortunately, the maker’s logo had either fallen off or was removed. He has now identified the computer, and his account, originally posted on the Classic Computing mail list, follows. A few years ago I inquired about an early 8-bit micro in my collection that I did not know the background on. Recently I learned more about the computer and thought I would share it with fellow history buffs. It was built by the Univac R&D Division in St. Paul, Minnesota, in 1972. They were carefully monitoring the developments at Intel with regard to its 4004 and 8008 microprocessors being developed. Part of Univac’s research was to construct actual computer systems to research and then build an application using the 8008. They started by building a 4-bit system similar to the one I have using Intel’s SIM4-01 prototyping and MP7-01 EPROM programmer boards. That unit was completed and demonstrated by March of 1972. 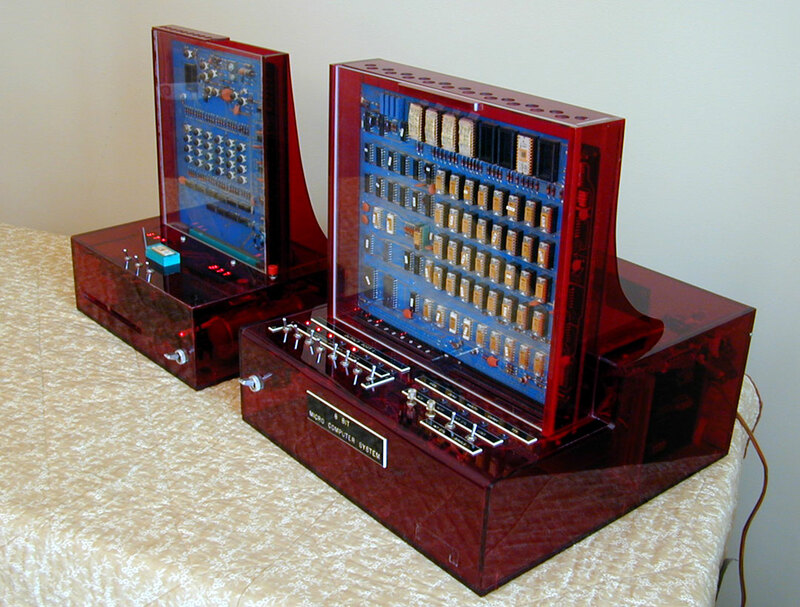 The Univac 8-Bit Micro Computer System incorporates the Intel SIM8-01 prototyping board (on right) and the Intel MP7-02 EPROM programmer board (on left). They ordered the Intel 8-bit system (SIM8-01 and MP7-02) when it was announced in April of 1972 and construction of my computer took place during the summer of 1972. Univac designed and built their own interfaces for these systems and used a Teletype for I/O. The Univac 8008 “8-Bit Micro Computer System” in my collection was complete and being demonstrated to various Univac divisions and military organizations by early fall of 1972. I visited with one of the Univac engineers that did some of the programming and he said that only very simple programs were used in demonstrations–like doing simple math operations or asking you to type in your name on the teletype and it then printed some phrase using your name. Univac spared no expense in developing this system as seen in the construction and fabrication of the cases which are thick, deep red translucent plastic. Not only is it a very aesthetically pleasing design, but it has to be one of the very first 8-bit computers fully assembled and operational. I have created a YouTube video that explains more about the system. Wow, great find. A very early system based on a microprocessor, and a remarkable product from the Sperry Rand Company (UNIVAC) what is known as a classic mainframe giant. Great article, thank you.